Love baseball? Love making $5,000 in a free contest? Sign up here. Today's podcast on running backs is a continuation of our Draft series pods. You can find Part I here. On part II, we discuss the top running backs in the 2015 NFL Draft class including Jay Ajayi, Todd Gurley and Melvin Gordon. And that list was in no particular order. Enough RB's come with enough, enough stylee. But when Ajayi busts a run we all know it's wicked and wiley. That's a lyric from the band sublime off 40 oz to freedom on a song called DJ's. Great song, and when I see Ajayi run he in fact does run wicked and wiley. He's my favorite running back in this draft Josh. You can check out an earlier article i wrote about Ajayi back in March here. The one thing you immediately notice when you see Ajayi run is his sense of purpose. He runs with a supercharged burst of energy and he also catches the ball well out of the backfield. There have been ongoing concerns with a knee injury which has been discussed in greater detail on many other blogs. But let's just assume for a second that it's not a big deal which all reports are currently indicating it isn't. Ajayi has incredible feet. He was a former soccer player and he loves to initiate contact. He might be the most aggressive runner in this draft. You'd be hard-pressed to find another runner with more heart than Ajayi. That being said, that same heart can also be a weakness. He sometimes stretches plays out for too long when he should just take a 3-yard gain. He's also had fumbling issues that will have to be taken care of if he expects to stay out of coaches' doghouses. But Ajayi has great size at 6'0 221lbs. He's your prototypical NFL running back. If the knee is not an issue, I really think he's a top 3 running back of this class and I would put him just behind Todd Gurley. In a league where you constantly hear reports that running backs are no longer valued, in walks a potential Top 10 pick at the position. It goes to show you that the draft is never about position aside from kickers and punters, it's all about value at a certain position. Sure, a running back likely will never go No. 1 overall, but any RB going in the Top 10 really says something about the potential Gurley has. Josh you've delved into Gurley a bit more than I have. I know you mentioned his off field issues with autographs but that can't possibly be a huge deal in the NFL can it? I mean, he's going to get showered with love for signing autographs and instead of shunned for it because of the out-of-touch NCAA rules. Below you'll see a highlight tape of Gurley. The biggest thing I've noticed about Gurley is his deadly combination of elusiveness and explosiveness through contact. Unlike Ajayi, who twists and turns and runs a little bit out of control at times, Gurley doesn't waste any motion when he runs. He's a slippery as they come in terms of shedding tackles, and he does it without making it look like he just poured out half a glass of his energy. There's also a smoothness to the way he's able to simply change direction slightly when he reaches the second level and run past the safety en route to the end zone. People have been calling out for everybody to slow their roll when it comes to comparing Gurley to the potential great runners and while I see their point, because he's not quite as explosive as say an Adrian Peterson. But there are runs where he looks a lot like Peterson. Peterson who take a hit and keep his legs churning then two or three more guys would jump on him and he'd be able to still create forward motion despite all those guys trying to push him into the opposite direction. Gurley shows that at times. You have to get really excited at the prospect of having this guy on your team. View cityofglendale's Flickr page here. With the NFL Draft just four days away, the Helpers start their first of four NFL Draft podcasts talking about quarterbacks including Jameis Winston, Brett Hundley, Marcus Mariota and Chris Bonner. They also go over some daily fantasy news and talk discuss the implications of the latest transgressions. The Helpers first start discussing Jameis Winston, the quarterback for Florida State who's likely going to be taken first overall in the 2015 NFL Draft. A former Heisman winner and National Champion, Winston fits the mold of a pocket passer who can make quick decisions, throw receivers open even if they're not, possesses above-average arm strength to make big plays down the field and also possesses the kind of athleticism that will allow him to create plays when the blocking breaks down. Of course, with any top pick, there's going to be nitpicking into every facet of his game both on and off the field. Most people already know about Winston's issues off the field. If you don't, a quick google search should solve that problem for you. While Winston possesses a great deal of potential as a franchise quarterback, the main concern for the Helpers is the team he goes to. The Buccaneers are an organization that's never had a true franchise quarterback. Josh Freeman, Mike Glennon and Bruce Gradkowski have all come through Tampa's doors and have all either left or failed to become a prominent starter within the franchise or both. When Tampa Bay won the Super Bowl back in 2002, they trotted out Brad Johnson while relying on a strong run game and one of the best defenses of the decade. There's no indication Tampa has improved when it comes to developing quarterbacks. Their offense was anemic last season despite some very strong performances from rookie Mike Evans. Evans strung together three straight games of over 100 yards receiving and multiple touchdowns, becoming the first rookie to have multiple 100 yard games and at least one touchdown since Randy Moss. Still, the Buccaneers coaching staff consists of Lovie Smith, a guy who couldn't mold Rex Grossman into a reliable starter. Smith also coached Brian Griese and Kyle Orton, two players largely considered backup caliber throughout the majority of their careers. We've seen young quarterbacks get thrown into tough situations almost immediately and flounder. Geno Smith was dealt a tough situation with the Jets, where Rex Ryan favored running the ball and playing defense over Sanchez slinging the ball all over the field. Smith has yet to throw for more than 13 touchdowns in a season and has nine more interceptions than touchdowns in his career. Granted, he had a lot worse weapons than Winston would start out with considering Tampa has two prominent receivers in Evans and Vincent Jackson to go along with a receiving threat at tight end in Austin Sefarian Jenkins. The Buccaneers are bringing in offensive coordinator Dirk Koetter, who helped the Atlanta Falcons to one of the best passing offenses in the league. Koetter's Falcon teams threw the ball a ton, and there's reason to expect him to dull the offense down a bit throwing-wise to adjust to Winston's proficiency within the offensive system if the Bucs do in fact draft Winston. Mentally, Winston definitely has a charm about him. He has the charisma, optimism and the gleam in his eyes of a confident player. I know, sounds like I'm in love with him. But it's evident there's a bit of an 'it' factor when he talks. He may not actually go out and be the guy who will be one of the greats of all time, but you certainly believe he can when you hear him talk. One of the most confusing prospects in the draft I can remember when it comes to where he will end up playing. So many rumors running through the mill that we could power a small town with the various teams interested in potentially trading up to get the Oregon prospect and 2014 Heisman winner. The most popular destinations for Mariota include Tennessee, San Diego, Washington and of course, Philadelphia. Eric Stoner's piece on Mariota pointed out some interesting things about Mariota's game and the style of offense he plays in. One of the big overall messages of the piece was how Mariota's thought process can be likened to a guy at a grocery store with a check list in his hand. Mariota has a set amount of things he can do, and rarely deviates from those things. When the play breaks down, he hangs on to his list of tasks until the bitter end instead of creating something different based on what the defense is giving him. It's not something that would make or break him as a quarterback per se, but it can be a huge detriment if the defense has got Mariota's decision making figured out. This is why I think Philadelphia has the greatest chance to mold Mariota into a fantasy impact guy immediately. The offense is geared to take advantage of Mariota's strengths as a task-oriented quarterback and his running ability will be a huge asset to it as well. We saw in early 2013 how Michael Vick was used in the offense and while Vick's injuries got the best of him, he did rush for 54, 34, 99, 41, and 79 yards in six games with the Eagles in early 2013. Mariota would likely hover around those rushing numbers if he did in fact sign with Philadelphia, which would make him an instant fantasy QB2. He might be the only rookie that would be a fantasy impact guy in 2015. Sort of like RG3 in 2012. My personal favorite quarterback of this class. i got a chance to watch Hundley live when UCLA came to Charlottesville to play UVa in the 2014 season opener last year, and Hundley impressed me with his ability to make tough throws when the defense was about to hit him. UVa had a very formidable defense last year, led by defensive end Eli Harold who anchored the pass rush, Hundley and the Bruins offensive line did not have an easy time dealing with the Cavaliers and nearly lost the game in the waning moments had Hundley not come through. View Mike McBride's page here. This year, like every other year, the NFL is about to receive an influx young, talented players that will have an immediate impact in the realm of fantasy football. However, if history has taught us anything it is that some of these rookies will shine (Odell Beckham Jr, Jeremy Hill, Mike Evans) and some of them will fade (Eric Ebron, Johnny Manziel, Bishop Sankey). The question is, which rookies are worth investing in, in 2015? One of these rookies worth investing in is the NCAA's leading rusher in 2014... Melvin Gordon. In his Junior season Gordon rushed 343 times for an incredible 2,587 yds and 29 TDs, leaving him with an amazing 7.5 YPC average. While of course these numbers will drop in the NFL, Gordon has proven that he has what it takes to compete at an elite level and will undoubtedly produce in the NFL, and more importantly, produce for your fantasy lineup. Talent aside, the most important factor in deciding when to draft the young RB (or any rookie) is what team he falls to. In this article we will examine not only Gordon's skill set, but also which teams he will see the most success with come 2015. Entering the 2015 season, there are a handful of teams that are in need of a strong presence at the RB position, one of the most notable teams is none other than 'America's team,' the Dallas Cowboys. In 2014, the Cowboys offensive line asserted itself as one of (if not the most) dominant O-lines in the NFL. Behind that line, DeMarco Murray was able to rack up 1,845 yards and 13 TDs. Measuring in at 6'0" and 213 lbs at the NFL combine, Demarco Murray's measurables are eerily similar to Gordon's. Add that with a zone-blocking scheme that Gordon has become accustomed to during his time in Wisconsin, we could see an incredible rookie season for the former Badger. In Dallas, Gordon's major competition would be the recently signed Darren McFadden and the former 5th-round pick, Joseph Randle. However, given his injury history, it's hard to believe that the Boys would put all of their eggs in McFadden's basket. It's also hard to believe that Dallas would put their faith in Randle who has amassed only 105 carries in two seasons. Another team in need of a fresh start at running back is the San Diego Chargers. After parting ways with veteran RB Ryan Matthews, the Chargers are an enticing option for any potential running back. Although Branden Oliver showed glimpses of greatness in 2014, by the end of the season he averaged only 3.6 YPC. If Gordon were to fall to the Chargers he would be expected to immediately take the reins as the starting RB. Couple that with the 'change of pace' trait in Danny Woodhead and Gordon would be kept 'fresh' throughout the season and able to do what he does best... run the ball. Combine that with an improved offensive line (added Orlando Franklin, among others, in free agency) and Melvin Gordon could immediately become fantasy relevant in all formats. A third team that could use a fresh RB is the Indianapolis Colts. Even with the recent acquisition of veteran RB Frank Gore, the Colts are in desperate need of a long term solution to their running back situation. After correcting their fatal mistake by dropping Trent Richardson this off season, the Colts signed the fading star of Gore to a 3-year $12 million contract. So if Gordon were to fall to the Colts come draft day, what can we expect from him next season? The answer is... not much. Like Fred Jackson, Gore just continues to be relevant in the fantasy world. If Gordon were to join the Colts, expect Gore to receive the bull's share of the carries until Gordon proves without a doubt that he is the better option. That being said, it's clear that adding Gordon would solidify their future as a dynasty offense with the three-headed monster of Luck-Hilton-Gordon. Standing at 6'1" 215 lbs, Gordon resembles (and plays like) a bulkier Jamaal Charles. Now of course, nobody can say that Gordon is guaranteed to see the success that Charles has seen in the NFL, but looking at the numbers, it's not impossible. During the NFL combine, Charles ran a ridiculous 4.22 40-yard dash. Although Gordon could only post a 4.52 40-yard dash (still an incredibly fast time), don't think that he doesn't have the 'big play ability' that Jamaal Charles has. In the NFL, the one thing more important than being able to outrun a tackler, is being able to cut and create space between tacklers... a skill that Gordon possesses. In the underrated 20-yard shuttle drill, Gordon posted an incredible 4.07, showing off his prowess as a back capable of changing directions on a dime. Assuming Gordon goes to a team that truly needs a running back, we can expect fantasy results that could rival that of last year's leading rookie rusher, Jeremy Hill. Projected as a first round pick in the NFL draft, expect Gordon to live up to (or even exceed) the hype. Look to target Melvin Gordon in the mid rounds of the draft and expect strong RB2 numbers with possible RB1 potential. Check out Phil Roeder's Flickr page for more awesome images. The only thing more difficult than trying to predict where top prospects will land in the NFL draft (especially before free agency) is trying to predict how those prospects will impact the world of fantasy football. The simple fact is that there are too many variables to predict not only what teams this year's prospects will end up with, but how they will be utilized on those teams. This article will focus on the draft prospect with the least amount of those variables today: Jameis Winston. As close to a lock as possible, almost all credible mocks have the Tampa Bay Buccaneers taking Jameis Winston with the #1 pick of the draft. With the release of veteran QB Josh McCown in February, the case for the Bucs taking Winston with the first pick was only strengthened. As the #1 pick, Winston will be expected to have an immediate impact in the Bucs offense. But what does this mean from a fantasy perspective? Can Jameis Winston adjust to the professional level and compete as a viable starting fantasy QB? In order to answer these questions we must take a look at not only Winston, but the Buccs offense as a whole. Will Winston have the protection needed to succeed? In 2014, the Bucs replaced four of their five starting linemen from 2013. These drastic changes did little to help the Bucs offensive woes. As a whole, the Buccs didn't fair too poorly in the running game, finishing as the 10th ranked team at run blocking. Unfortunately for Winston, the offensive line also finished as the 26th ranked unit at pass blocking. It's clear that the Bucs need to improve their offensive line if Winston has any shot of achieving fantasy relevance. Even with an offensive anchor in tackle, Demar Dotson, the Bucs will certainly look to add depth to the offensive line through free agency and the draft. One final thing to note about the Bucs offensive line is their discipline. They finished with the most penalties of any offensive line in the NFL which if continued in 2015, will almost assuredly take away some of Winston's big gains through the air. Will Winston have the weapons needed to succeed? The simple answer here is YES. Winston will be entering the NFL with a powerful combination of receivers in Mike Evans and Vincent Jackson. Mike Evans, the #2 rookie WR in 2014, finished 10th overall in standard scoring. With Winston's big arm and love for throwing the ball deep down the field, we may be witnessing the beginning of a QB/WR combo that could end up being one of the best in the NFL. In terms of the rushing game, the Bucs will hope that Doug Martin (after two years of being plagued with injuries) can repeat the success he achieved in 2012 (1454 yds, 4.6 avg). Regardless if he can or can't, the Bucs will look to add depth to their RB core this offseason, whether it is through free agency or the deep RB class in this year's draft. Finally, at the TE position, Winston will hope that sophomore TE Austin Seferian-Jenkins can live up to the hype next year. Taken in the second round, Seferian-Jenkins had high expectations after last year's draft. Unfortunately his season was plagued by injuries and we have yet to see just what this prototype TE is capable of. Does Jameis Winston have what it takes to compete in the NFL? When looking at Winston, there’s no doubt that the talent needed to compete at the professional level is there. As a natural pocket passer, Winston has a big arm and loves to throw the ball down the field. Additionally, his size (6’4”, 231 lbs) and his decent mobility allow him to keep plays alive and allow his receivers time to get open. When watching film, it’s clear to see that Winston knows his receivers. He consistently places the ball in a spot where only the receivers have even a chance of catching the ball. Combining that with tight spirals and a strong knowledge of the game, Winston has an excellent chance of succeeding at the professional level. Even with all of these positive attributes, there are a couple of major concerns when considering Winston as a fantasy relevant QB. One of course is his off-field issues. Fortunately, Winston has recently addressed these issues and truly impressed both scouts and coaches during his combine interviews. The other more important concern is his interceptions. During his Heisman winning season, Winston threw for 40 TDs and only 10 INTs. Those numbers drastically dropped his senior year, throwing for only 25 TDs and 18 INTs. His big arm doesn’t help him here as he more than occasionally overthrows his receivers and tries to force the ball into tight coverage. We can only hope that the Bucs coaches can help Winston to develop in the preseason and get those big-armed throws under control. So what can we expect from Winston in 2015? Winston has all the tools needed to succeed in 2015. As a Heisman winner, we know that the talent is there. As a top priority (especially with a rookie QB), the Bucs will definitely spend the money to improve their offensive line in the offseason. Additionally, the Bucs have a strong receiving duo in Mike Evans and Vincent Jackson who both love to catch 50+ yard touchdowns, perfectly complementing Winston’s big arm. Coupling that with a healthy Doug Martin and Austin Seferian-Jenkins, the Bucs could have a very strong offense next year. Comparing him to current NFL QBs, Winston reminds me a lot of Big Ben Roethlisberger. Between his size, his arm, and surprising ability to move in order to extend plays, the Bucs may have just found their franchise quarterback in Jameis Winston. View Kathy Vitulano's flickr page here. One skill we always value when it comes to drafting fantasy potent running backs is the ability to catch the football. Now, you might think a good receiving running back is only valuable in PPR (points per reception leagues) but that is simply not true. While receiving running backs definitely have more value in PPR leagues, they're also highly draftable in redraft leagues. Of the Top 7 fantasy running backs last year, only one guy didn't have at least three receiving touchdowns. Two out of the top 4 had at least 800 receiving yards while the bottom three of those seven guys had receiving touchdown totals of 4,5, and 4 respectively. The one guy who failed to register a receiving touchdown happened to be the top fantasy running back in the league, in this case DeMarco Murray. But Murray was an exception to the rule considering he carried the ball over 100 times more than any other running back in the league last year and was also gifted with an outstanding offensive line. Plus, Murray still compiled a respectable 57 catches for 416 yards, so he was still a potent receiver despite not having a catching touchdown to his name. One big thing you have to remember is that catching the ball is a skill, not an athletic gift. Skills don't fade, but athletic ability does. We've seen countless running backs keep themselves valuable into their 30s with their ability to catch the ball. Bills running back Fred Jackson is still fantasy relevant and he just turned 34 years old. Jackson caught a career-high 66 passes in 2014 at age 33, totaled 501 receiving yards and caught a touchdown. Eagles running back Darren Sproles caught 40 passes at age 31 last year with the Philadelphia Eagles. Receiving skills don't go away, and if you're looking to invest in somebody long term for a dynasty league, then these are the skills you should be valuing. Overall, finding a good receiver for your running back spot can enhance your chances of avoiding dud performances due to the variety of ways in which he can get you points. Anybody can fall victim to what's known as 'gameflow' in fantasy football. An example of gameflow working against you would be something like... if a running back only puts up 30 rushing yards because his team gets down early and they have to pass the ball. On the other hand, a receiver can end up with zero catches if a team scores a lot of points early and just runs the ball to chew up clock late. So, if you have a player that can both catch and run the ball, your chances of falling victim to gameflow decrease drastically. Plus, with the NFL still being a passing-based league despite many teams eying to replicate the Seattle Seahawks' formula centered around running and defense, it's always good to have a receiving back in general. Overall, you should be looking for a solid receiving back in your dynasty draft. And if you're looking to find guys who might have the talent to do that, look no further than Alabama running back T.J. Yeldon. First, let's talk about Yeldon's ability as a rusher since that's always the chief talent that will keep him on the field in the first place. Though Yeldon only ranked 61st among all rushers in 2014, he finished with a respectable 979 yards and more importantly, 11 touchdowns on a solid 5.0 yards per carry. He's not a real physical runner and also runs with his pad level tad high at 6'1. Ball security issues where a huge concern as well, as he fumbled 10 times in 576 carries. Like most running backs, Yeldon also struggled in pass blocking, opting to throw his shoulders around instead of squaring up to block incoming linebackers and defensive linemen. Those are his biggest weaknesses and what may keep him irrelevant in fantasy despite his catching ability. We'll just assume he works on those flaws and gets better for the sake of argument. Yeldon, like most Alabama running backs before him, wasn't asked to catch the ball much in Alabama. The Crimson Tide instead relied mostly on Amari Cooper for their receiving needs, as Coop accounted for over 70 percent of the team's total targets, an incredible number when you figure the best wideouts on NFL teams might account for 30-40 percent of total team targets. Still, even though he didn't catch the ball much, it doesn't mean he doesn't possess the skill. His fellow Crimson Tide teammate, Eddie Lacy, actually wasn't much of a receiver out of college either. Lacy quickly erased any doubt that he could be a valuable pass catcher in the NFL when he finished with 42 catches (13th most among RBs), 427 yards (6th most among RBs) and 4 touchdowns (tied for 4th among RBs) in 2014, which was only his second NFL season. 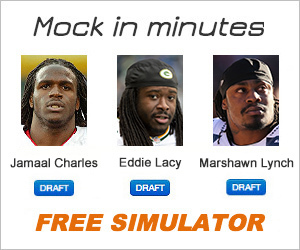 Of course, Lacy benefited from playing with Aaron Rodgers, who's one of the leagues best quarterbacks. Since we don't know who will be throwing Yeldon the ball just yet, we can only look at his individual catching ability based on his college tape. Lets take a look at some of his receiving examples out of college to see if he actually can catch. In this first clip against Mississippi State from 2014, Alabama quarterback Blake Sims looks down the field at his receivers, who are both covered. He then looks to the far sideline and hits Yeldon, who's running up the sideline, on a wheel route. Yeldon makes the catch cleanly and maintains his balance on the sidelines, getting both feet in bounds. Overall, some good awareness of the sideline there. Also, he catches the ball with his hands and keeps it away from his body, which is a good sign his hands are soft. This one is probably my favorite examples of Yeldon's catching ability and it's not even a true completion. Sims fakes to Yeldon, who then runs up the sideline and manages to haul in a long pass with a corner draped on him and a safety coming over the top to drill him. Yeldon doesn't complete the catch all the way through, but he still does three things very well. For one, he sheds the defender to create space and get himself open. Two, he has to turn his body around and lean back to adjust to the pass. Lastly, he times the catch perfectly, catching the ball at the peak of his jump. These are the kind of ball awareness skills every good receiver has. Plus at 6'1, Yeldon is a little bigger than most running backs and can use his size on contested balls like that. In the last example, you get an idea for what Yeldon can do in the open field. Yeldon makes a simple catch out of the backfield, one nearly every running back can make, and then moves the ball up the field and makes on defender miss before being tackled from behind. He makes the catch at about the opponents 47-yard line before advancing the ball all the way down to the 32. Once he knows he's about to go down, he doesn't fight for extra yardage and instead falls down before a defender can lay a big hit on him. Overall, Yeldon doesn't look flashy in the open field. He's not super quick and he's also not strong enough to move the pile. Still, a lot can be said about his reliability as a receiver. He will produce in the receiving game when on the field at the NFL level. He just has the right instincts, ball skills and overall reliable hands you'd want out of a quality receiving back. Regarding how that translates to fantasy football, Yeldon will likely not start in his first year, which makes him undraftable in most redraft leagues unless he's gifted a starting role like Bishop Sankey was with Tennessee last year. But as we all know with running backs, injuries can rear their ugly head at any moment. If Yeldon does get an opportunity, he will be a good flex play because of his catching ability. Expect him to be a good plug and play guy when right opportunity comes about, especially in PPR leagues.